Today was Abby's very first stock show, and I just had to blog it before I forgot and while the boys were sleeping. First of all, Byron has thought all along that one of the pigs was his anyway. Well, last night, we got some pleasant news that they were going to begin with a PeeWee division and let everyone 2nd grade and under show a hog. So, Byron got to pick which one he wanted, and boy did he pick the right one!!! Hershey, the Duroc gilt, was his choice, and she showed like a champ! She won him a showmanship ribbon after peeing on him! The judge moved him out of the way, laughed and gave him a ribbon! Byron didn't quite know what to do so just stood still. He looked to Dad at the edge of the ring and was told it was ok, and he moved on. I would have gotten a picture, but I was laughing too hard! So then it was on to Abby. They began with the Duroc breeding class. She did SO well! 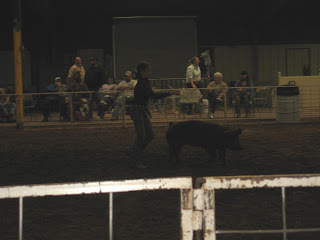 That pig was just like an extension of her and pranced around just like she was suppose to. The judge liked it and gave her FIRST PLACE! Wow! The very first time she showed!!! I was so proud of her! So then, every champion gets to return to the ring where they literally pick the best of the best. She got SECOND PLACE there and received a beautiful belt buckle! We were on a roll!!! But that is where it stopped. She still did well, received another ribbon for 5th place and one more for 3rd place. All in all, not a bad first run and BOY, was it fun! but exhausting! Here are some pictures from the day. The day began (at lunchtime) with some french fries. No those are not his pajamas. It just kept him warm and kept me from having to keep up with socks. He has grown fond of pulling them off. Actually, only the right one... Chowin' down before the show. They were famished! PawPaw and Byron waiting to show his pig. That kid looked like he had been doing this his whole life. And he got rewarded for it! A little down time for Collin. He had to be held the whole time. NO WAY was I going to put him down anywhere in there! Oh, the things he could have put in his mouth! I cringe to think of it.... He did take a nap surprisingly. I really didn't get very many good pictures of her actually showing. And the ones that weren't blurry ended up dark. Must be the operator..... Our little winner! We are SO proud!!!! Showing the Hamp. He didn't do so well. But, like Dad and Paw Paw said, that is just one person's opinion..... A little more down time. I wonder if I could get some of those pens for the house..... The trophy, the buckle and the pig This is what I found in my backseat when we got home. And we ALL feel that way.